In October last year, former Federal Reserve Chair Janet Yellen called it “the biggest surprise” facing the US economy. She wasn’t referring to the country’s booming stock markets or the fact that Donald Trump had presided over the lowest rate of unemployment seen for more than a decade. No, she was referring to inflation; specifically, why it had remained stubbornly low. Across developed economies, the annual rate of inflation has been steadily falling for a number of years. In the US, inflation averaged 7.1 percent in the 1970s, 5.6 percent in the 1980s, three percent in the 1990s and just 2.6 percent across the 2000s (see Fig 1). Over the same period in the UK, inflation fell by 10 percent. A similar story has played out across many post-industrial nations. Although few are clamouring for the return of the rampant inflation of the 1970s, too little inflation is hardly ideal either. Traditionally, a small amount of manageable inflation has been viewed favourably as a way of greasing the economic wheels and eroding debt. It also encourages individuals and businesses to make purchases today instead of putting them off until tomorrow. This is why central banks, like the Federal Reserve in the US and the Bank of England in the UK, as well as the European Central Bank, all have inflationary targets to meet – usually around the two percent mark. Despite favourable global economic conditions, this target has, for the most part, proved elusive, leaving economists and policymakers perplexed. With unemployment at record lows and the global economy experiencing a sustained period of expansion, wage growth and consumer demand should be higher than current measurements indicate. The answer to the inflation conundrum may lie online. Internet giants like Amazon and Google now allow consumers to compare prices at the touch of a button. Digital content providers, such as Netflix, offer inexpensive entertainment at a fraction of the cost of purchasing physical goods. Although technology has undoubtedly boosted economic growth, it may have had the opposite effect on inflation. Despite a loyal customer base in excess of 300 million, Amazon has had to put up with its fair share of criticism. Having been blamed for the closure of once-beloved high-street stores and castigated for its questionable tax dealings, the online retailer is certainly no stranger to bad publicity. And yet, it may have come as some surprise to be held culpable for Japan’s long-running deflationary issues. The theory goes that Amazon’s huge scale and extensive distribution network allow it to offer goods at lower prices than those offered by physical stores. This creates downward price pressures that make it difficult for inflation to reach central bank targets. And, as Kato touched upon, the threat Amazon poses to inflationis not confined to Japan. In the US, research by Adobe Analytics found that average prices of online sales in the furniture and bedding category have fallen by 8.3 percent over the past two years. The consumer price index, which includes offline sales, fell to less than half that amount in the same time. Similar discrepancies were also found in sales of sporting and clothing goods. If causation is difficult to prove, the correlation is certainly pronounced. 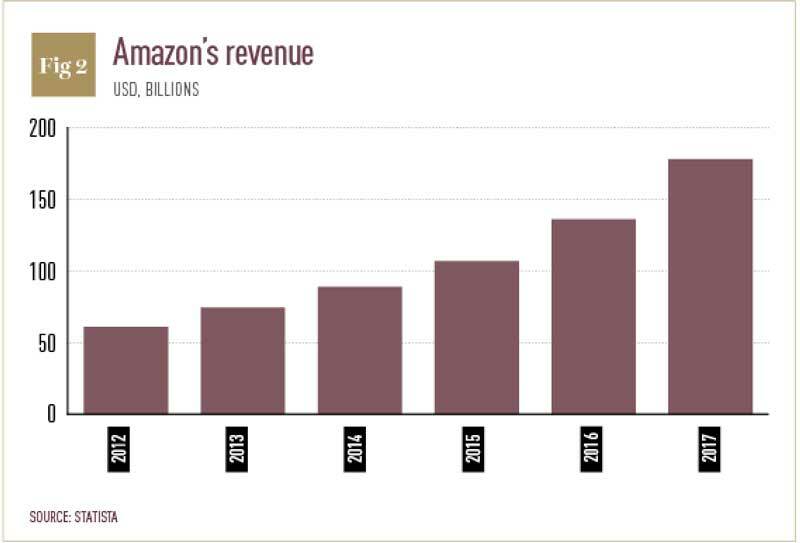 Between 2012 and 2017, when Amazon’s revenue almost tripled (see Fig 2), commodity prices (excluding food and energy) fell three percentage points. Not all the blame can be laid at Amazon’s feet, however. Other online retailers, like Alibaba in China, are having a comparable impact. The deflationary power of major retailers is also not purely a digital phenomenon. The rise of huge supermarkets and low-cost goods arriving from Asia began eroding consumer prices long before the internet made its mark. Some of the other major technology corporations also deserve closer scrutiny. Google has made it easier than ever for consumers to comparison shop, making it harder for businesses to raise prices. In fact, with Google Product Listing Ads, online users need not even be actively shopping before they see a price comparison. Greater consumer price awareness has certainly corresponded with a prolonged period of price depreciation, which in turn has had a knock-on effect on the rest of the economy. Last year, it was estimated that falling commodity prices, again excluding food and energy, caused a 0.25 percent decrease in the core inflation rate. In 1958, the New Zealand-born economist William Phillips authored a paper titled The Relation between Unemployment and the Rate of Change of Money Wage Rates in the United Kingdom, 1861-1957. 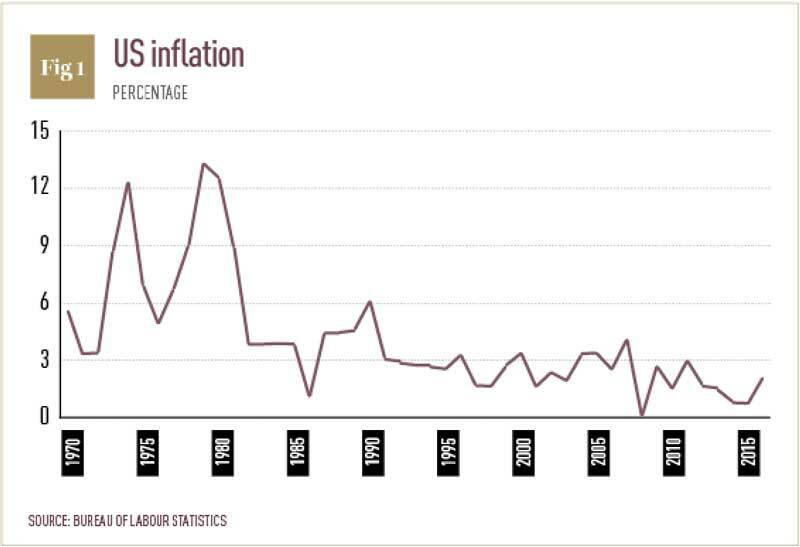 As part of his research, Phillips discovered an inverse correlation between unemployment and inflation – as unemployment falls, firms have to increase wages to compete for fewer workers, which leads to higher prices. The ‘Phillips curve’ was born, and economists believed – for a time, at least – that higher inflation was a trade-off that had to be tolerated in order to enjoy lower unemployment. However, when the 1970s saw many developed countries experience both high inflation and unemployment concurrently, the Phillips curve took a significant hit. Today’s low unemployment, low inflation economy may provide the knockout punch. A long-held criticism of the Phillips curve is that it only holds true in the short term. Over an extended period, employees may begin to pre-empt inflation, arguing for wage rises that compensate for expected price increases. In this situation, inflation will increase, but unemployment will not fall – at least, not for a sustained period. The modern-day failure of the Phillips curve to accurately predict inflation has other root causes. The reduced influence of unions has hampered employee bargaining, while technological improvements have created supply-side efficiencies that simply couldn’t have been envisaged back in the 1950s. Because inflation is being driven down by an increase in supply, rather than a fall in demand, it can comfortably exist alongside low unemployment. When looking at some of the most successful digital businesses, supply-side gains are increasingly prevalent. Camera phones and the rise of social networks like Facebook and Instagram have meant more photographs are being taken than ever before, but have also caused a crash in the value of photographs. Digital businesses are also increasingly adopting automation technologies to create greater supply-side efficiencies. If the deflationary effect of online giants is still up for debate, then its long-term impacts are even murkier. As the digital economy becomes more developed, it is difficult to say whether downward price pressures will be sustained. Given the monopolistic tendency of online markets, some would say it is unlikely. 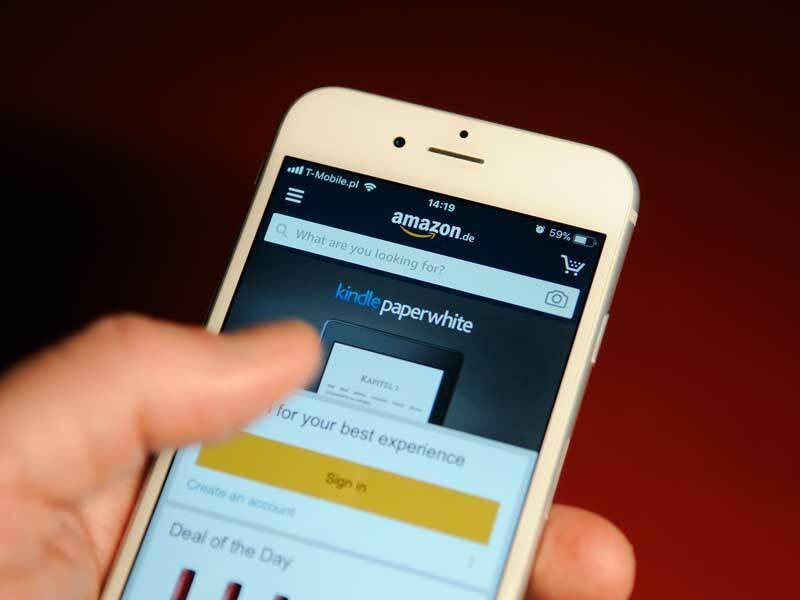 Amazon already handles 44 percent of all e-commerce sales in the US, Google accounts for nearly 75 percent of online search queries worldwide, and Facebook collects a substantial, and growing, portion of the web’s advertising revenue. As competitors become increasingly insignificant, the incentive to offer free services or low-cost products begins to fade. More sophisticated use of data will also allow online heavyweights to increase prices. Data, whether it’s harvested from Facebook, Google or any other online platform, could easily be used to create personalised pricing or take advantage of other real-time market dynamics to ensure businesses receive the optimum price for their products. An example of how this can create upward price pressures has already been demonstrated through Uber’s use of surge pricing during periods of high demand. The deflationary power of Amazon and co may prove to be temporary. Conversely, the rise of the digital giants is also creating, in Hafeez’s words, a “winner-takes-all dynamic” that could be causing a more persistent drag on demand. Labour share across the OECD nations is declining, particularly in the US, and productivity differences between the top five percent of firms and the rest are widening. Altogether, this is contributing to the growing income inequality that is being witnessed across the developed world. If digital firms are indeed exacerbating wealth concentration, they will also reduce demand in the long term as a result of wealthier individuals’ lower marginal propensity to consume. Not all the blame for low inflation can be laid at the feet of new technology firms – globalisation and the after-effects of the financial crisis are also factors – but the downward price pressures they exhibit need to be studied further. Certainly, economists and policymakers will be keen to understand the root cause of the lower-than-expected inflation we are currently experiencing – and not just so they can meet their central bank targets. With inflation stunted, it remains difficult for central banks around the world to raise interest rates, which partly explains why they remain reduced compared with the levels seen before the 2008 financial crisis. This has meant that central banks currently have little room for manoeuvre if another recession was to occur. As a result of the low inflation, low interest cycle we are in, banks may be forced to implement sub-zero interest rates following another crisis – something that is far from ideal. “The most important thing to remember is that inflation is not an act of God, that inflation is not a catastrophe of the elements or a disease that comes like the plague,” explained the 19th-century economist Ludwig von Mises. “Inflation is a policy.” So too is controlling the economic impacts of digital giants. If the likes of Amazon, Google and Facebook are pushing prices down and increasing inequality, then governments must try to counteract this by boosting demand and labour share. A policy of doing nothing could be one that markets live to regret, particularly when the next financial downturn takes place.